It was a day that started out like the other days of the journey. There was nothing in the air that signaled that today was the day that a special surprise was going to happen, a visit from Almighty God by His son, Jesus. The ancient word of the prophets had long predicted the event, but there was no word to indicate the day except for a longing expectation in the hearts of a few faithful saints. As Joseph and Mary stirred that morning, there was a sense of urgency to get to Bethlehem before darkness fell that evening. They were on their last leg of a long, difficult, walking journey of approximately 100 miles depending on which route they took from Nazareth to Bethlehem. Their ruler, Caesar Augustus, had sent out a decree that all the world was to be taxed and each man had to return to his hometown to register. Because Joseph was in Mary’s hometown of Nazareth, and he was of the lineage of David, he had to return to Bethlehem. Scripture doesn’t tell us all the details, but it does give us clues, so I am going to do some surmising as to what took place. Usually people traveled on foot or donkeys and in groups for safety from bandits, especially for such a long trip that took 7-10 days over rough terrain. Historians suggest that this journey most likely took place in September. (Some say it could have been early spring). September would be after the hot summer months of July and August and before the cold winter season set in. Shepherds would still be grazing their flocks of sheep in the fields. Joseph was faced with a difficult dilemma. Mary was in her ninth month of pregnancy and heavy with child. Her baby could be born any day. He had to pay his taxes or face heavy penalty or punishment and a group from Nazareth was preparing to go. He could not bear the thought of leaving Mary alone. After weighing their options, they decided they had to go, together. 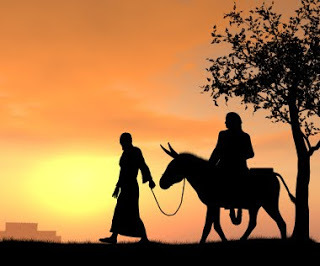 Joseph secured a donkey for Mary to ride (scripture does not give us this detail) and with nervous apprehension they joined the group of other travelers heading south. Mary did not complain but the trip was all she could handle. She was weary, sore and her back hurt. They struggled to keep up with the group. And then, finally, they were starting their last day, Bethlehem was within reach. They attempted to keep up with the group but as the day progressed they lagged further and further behind. Mary suspected she was in labor. Joseph’s jaw tightened as he nervously watched Mary shifting on the donkey’s back, holding her back and silently rubbing her tightening belly. He quietly urge the donkey forward, as he glanced at the sun setting over the western sky. Their group had long disappeared from view. Many thoughts tumbled through his mind as he began to question the wisdom of their decision, unaware they were plodding towards a divine appointment under the guidance and protection of the Almighty God. The ancient prophets had long foretold that the Messiah would be born in Bethlehem. It was dark when the exhausted couple stumbled into Bethlehem. Joseph knew they were in urgent need of a place of rest and privacy. There were only a few guest rooms available in town for weary travelers. Usually the locals would take travelers into their homes for the night. The little town was bustling with people, scurrying around caring for their families and animals. Lively chatter echoed from the rooftops as locals entertained their overnight guests. No where was there an extra room. The town was full to overflowing, their travel companions had beat them there. Finally, one sympathetic innkeeper offered them a spot in the stable with his animals. It was all he had. He never dreamed he would soon be hosting the Son of God. Joseph and Mary eagerly accepted his offer and a few hours later in the quietness of a dimly lit, earthy, smelly, stable, Emmanuel was born. With excitement they told Joseph and Mary about their evening: how they were sitting in the field when suddenly a whole host of angels had joyfully visited them, praising God, and with the news that a Savior had been born. and where to find him. The never doubted it was God who had revealed the very special news to them and left their flocks immediately to go to Bethlehem. They left the stable excited with what they had seen and told everyone they met what they had just witnessed. After the shepherds left, Joseph pulled Mary close and held her tight as they soaked in the significance of what had just happened. They had never doubted what God had told them about the baby but the circumstances had been so overwhelming, confusing and difficult. They had faced tremendous pressure, criticism and slander. Only a few believed and supported them. After the angel had confirmed to Joseph early in the pregnancy that Mary was indeed pregnant by the Holy Spirit and he was to take her as his wife as planned, he did so. Joseph tenderly loved and cared for her but did not consummate the marriage until after the period of purification following the birth of their son. Scripture was fulfilled, Jesus was born of a virgin. An extra-ordinary day. Joseph and Mary knew without doubt that their precious baby was the Son of God. Their hearts swelled with joy at the needed reminder and confirmation from the shepherds. God was with truly with them. Emmanuel had come. They called him Jesus. 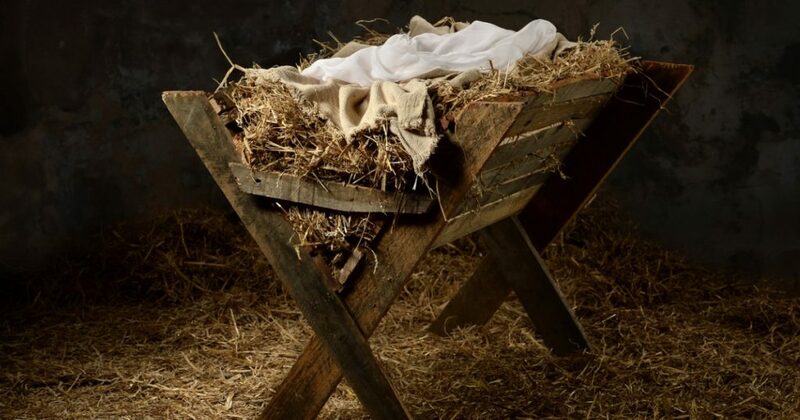 Manger picture was taken from the following Breakpoint.org website. Joseph and Mary picture was taken from RKBentley blog. The Bible records the story but not the day. 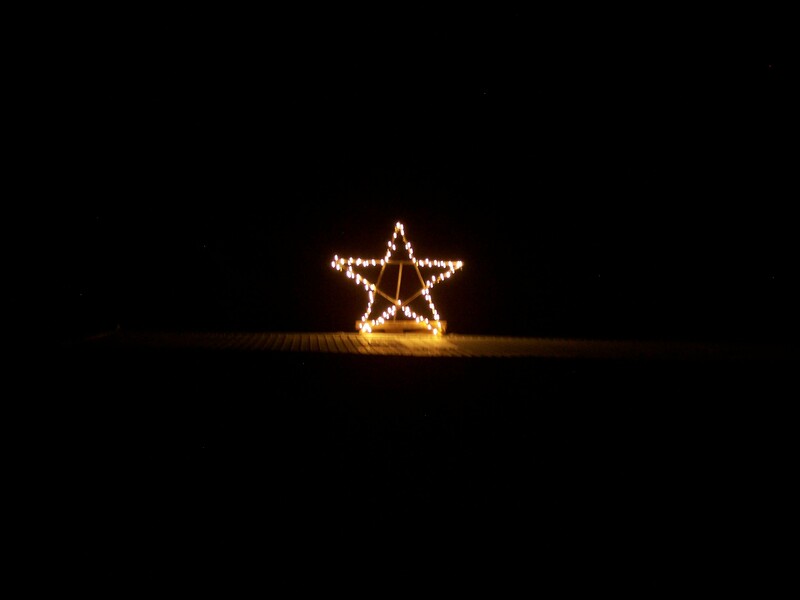 “High on my list of favorite things is lighting the nativity star on our farm the day after Thanksgiving. The star used to be one of the most popular Christian Christmas symbols. As a star shines light on a dark night, the nativity star represents the light of Jesus in a dark world. Since the beginning of time stars have been used for navigation. Over 2,000 years ago, one particular star guided the wise men (astrologers) to the promised Messiah. When they entered the house where the young child lived, they fell to their knees in holy awe and worshipped the Son of God. (Matthew 2). There is nothing glamorous about the nativity star, but it radiates a silent holiness as it shines forth a message of remembrance, of hope and of promise. Sadly, it has been removed from most Christmas decorations. It no longer has the place of honor on top of Christmas trees or shines from rooftops. Santa has not stolen it’s glory, nor has it’s meaning been distorted; it has just simply, quietly, disappeared. The last several years I have looked for stars as we travel during the month of December. You can travel hundreds of miles and see just a handful. I am reminded of the song “Light One Candle” written by Peter Yarrow and sung by Peter, Paul and Mary in the turbulent 60’s. It was written as a protest song but I found myself singing the chorus this week. I have lit my star. May I challenge you to light one star? If every Christian in America lit a star there would be millions of glowing, radiant stars giving testimony to the real meaning of Christmas, the birth of the promised Messiah, Jesus Christ. If you follow me, you will not walk in darkness but will have the light of life. I couldn’t share this “piggy-bank” gift idea until after Christmas since they were gifts for my grandchildren. Here is the story behind their “piggy-banks” (money-jugs). This past spring at our Fun Day on the Farm, Ryan (who is 6) saw a customer pay for their purchase with a $100 bill. He was instantly hooked. He became obsessed with wanting a $100 dollar bill, even begging for one from what he thought was his sympathetic, “soft-hearted” grandma. He fretted about what he could make and sell at the next Fun Day so he could have one of those coveted $100 bills! His obsession was so intense in the following days that his parents finally had to forbid him to talk about it. 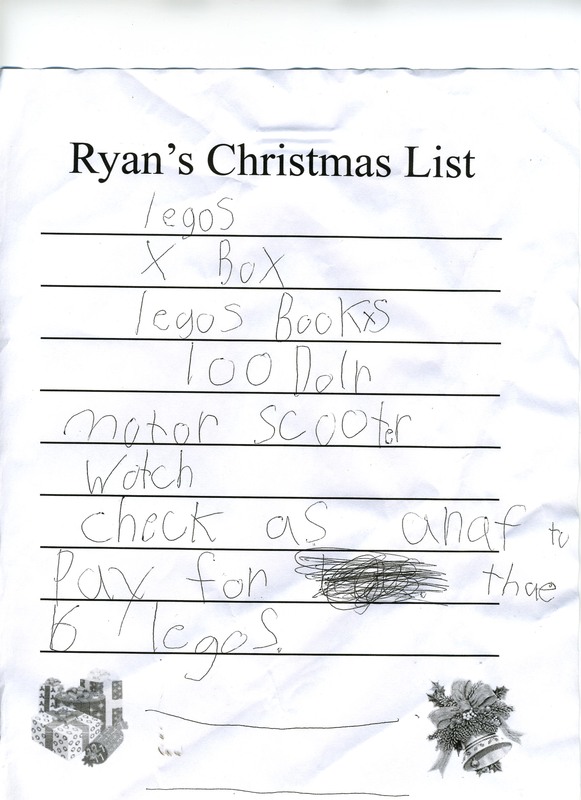 But Ryan has not forgotten and sometimes will mention that he is still trying to think of something he can make and sell to earn money. He is highly motivated with “earning” money so he can spend it on his beloved legos. This summer when Karla and Ryan were at the farm they found lots of things in the farm store they wanted to buy but didn’t have enough money to do so. 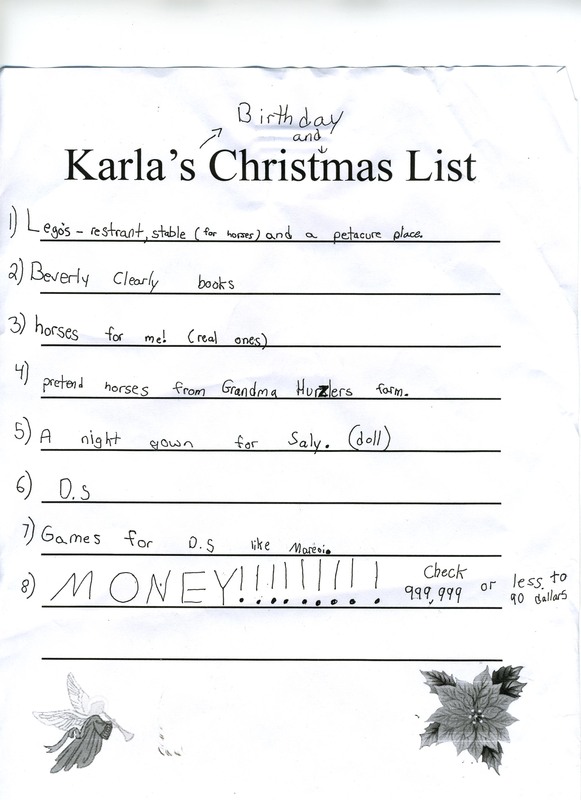 Finally I made them a “Christmas Wish List” paper and told them to write down what they wanted for Christmas. 4) pretend horses from Grandma Hurzlers farm. Through the fall and winter, money continued to be high on their Christmas list so I decided money they would get but I wanted a creative way to do it! One day a customer came in the store and handed me a cardboard box with 4 empty one gallon glass vinegar jugs. (Remember those old-fashion jugs?) He said, “I figured maybe you could do something with these or know of someone who can.” They sat in the store for weeks while I wondered what in the world I was going to do with them. 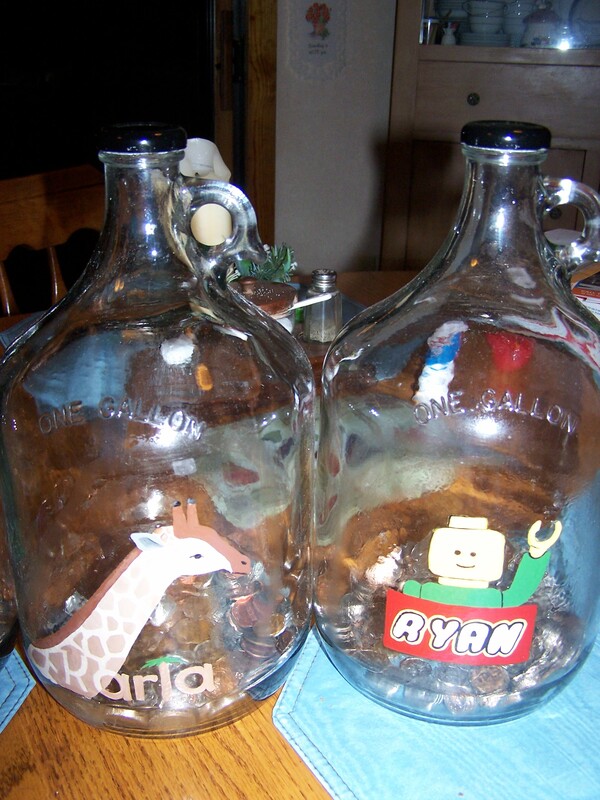 One day the idea hit me-money jugs for the grandkids! I have a friend (Sheila Schaefer) who very creatively painted their names on the jugs for me. I put $20 worth of coins in each jug. I told them that when they get $100 worth of change I will match it and then they have to put the $200 in their savings accounts for college. (They are not allowed to let anyone “stuff” their jugs-they have to save or earn the money). After that their parents can set the rules for their money. 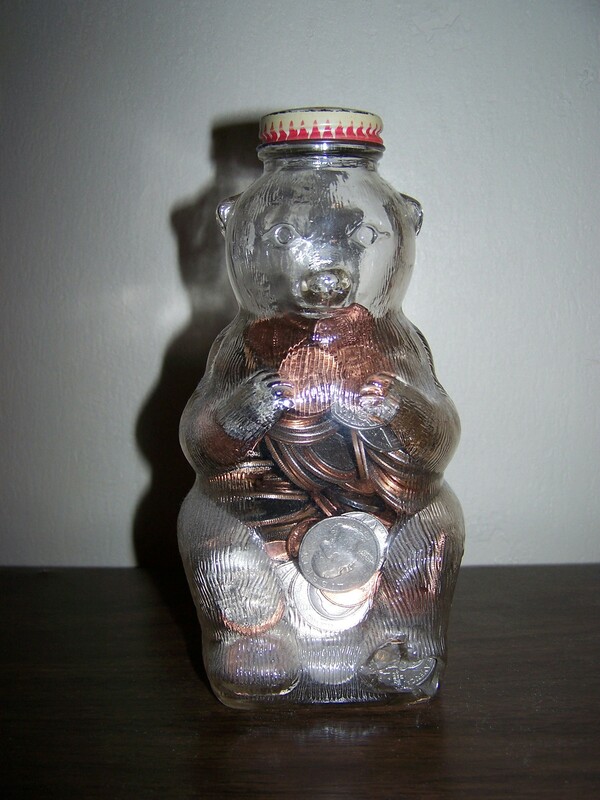 When I was a little girl I received a glass bear “piggy-bank” which still sits on my dresser. It stays full of change I “find” in pockets, the washing machine or left laying on the dresser. Periodically I use the collection for “Penny Power” at church or some other worthy project. This is one of my childhood treasures. The right hand toe has broken out and I have to put quarters in the bottom or the smaller change will fall out. Hopefully these jugs will become treasures and hold memories of a special Christmas that they can share with their children. Each year it is with great anticipation that I plug in our nativity star. I love the star! 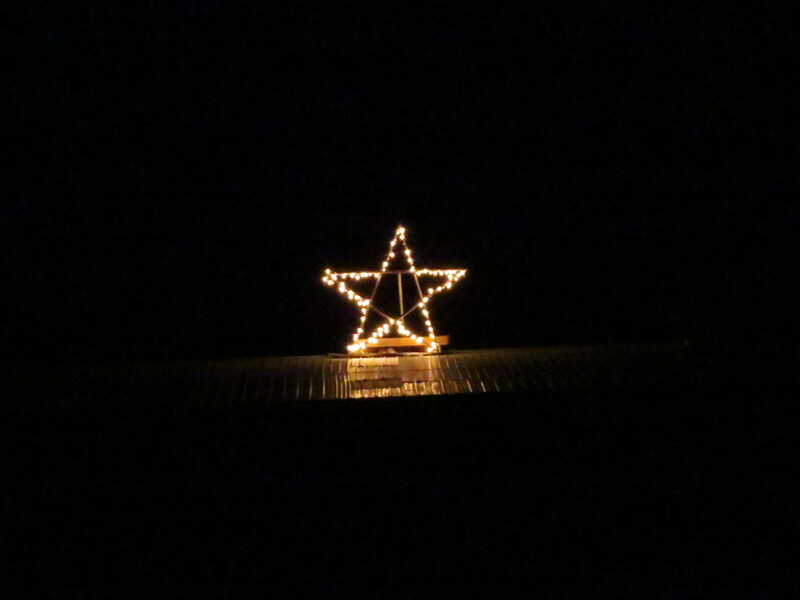 The 7′ tall star sits on top of the horse stable on the hill of our farm and shines it’s brightness into the dark night for all the Route 60 travelers to see. When we come home on a dark evening, I love seeing it off in the distance-one lone, brightly shining star. When you get closer you can see its light glistening as it reflects off the roof. There is something so peaceful, so serene and so holy about that star! The star that the wise men followed in search of Jesus has become a symbol to represent Christmas even though the journey of the wise men was not completed until one to two years after the birth of Jesus. There was no special star marking the bustling inn in Bethlehem the night Jesus was born in spite of what Christmas propaganda portrays. In my mind, I envision a cold, dark night with millions of stars winking and twinkling with glee over their heavenly secret. We love to tell the story of the wise men (magi) riding on camels following the star as they bring their gifts of gold, frankincense and myrrh to the young Jesus. They came from a far-away eastern country and history suggests that they may have first spotted the star on the night of Jesus’ birth. But there is more to this story. These men were astrologers and they also knew the prophecies of the Messiah’s coming. There was something about the “new” star that caught their attention and beckoned them to follow. Was it brighter than all the rest? Could they only travel at night so they could follow it’s glow? Did it hang lower in the sky? This was no ordinary star as stars don’t move. Herod sent the magi on their way to search for this “king” with the request that they come back and report to him where they found him so he could also go and worship the young king. The star guided the magi to the very house where Jesus lived with his parents. After leaving they were warned in a dream to not go back to the wicked Herod. When Herod realized he had been betrayed, he became enraged and ordered all baby boys two years old and younger in Bethlehem and the surrounding area to be killed. What followed was the tragic slaughter of many baby boys as they were ripped from their screaming, terrified mothers’ arms and killed before their eyes. When I think of that star-a star sent by God to guide magi to His Son, I realize that the star also set off a series of events instigated by the devil that lead to horrific tragedy for hundreds, perhaps thousands, of innocence babies and families. These families would bear the scars of that suffering forever. 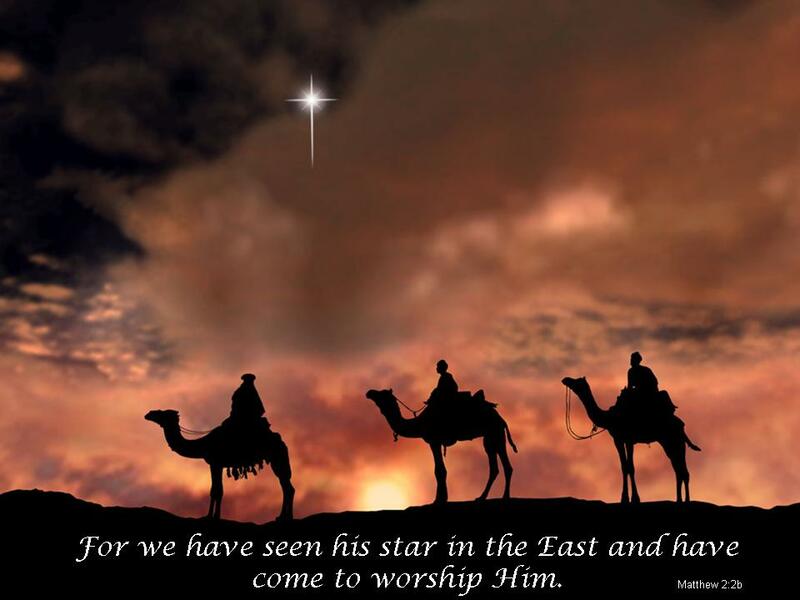 The star had significant purpose as it guided the magi to the Son of God. Today it is a symbol of beauty and light for Christmas. It minds us of the wise men bringing their gifts and worship to Jesus. It also reminds us to seek the Messiah, the Son of God, as diligently as the magi and to bring Him our own gifts and worship. When we travel I look for other stars. It appears that most have disappeared and have been replaced with reindeer, Santas, sparkling trees, sleighs and candy canes. Satan is still trying to deny the birth of the Son of God. He is deceiving our society to the truth of the gospel. Our society is losing it’s spiritual conscience and awareness to the true meaning of Christmas but the truth of God’s word still shines clear to those who chose to seek Him….